Having unleashed another memorable set-piece play that worked to perfection, it seems rather strange that Ireland's attacking game-plan has come under the microscope over the last few days. But that's what happens when Joe Schmidt's players dip below the extremely high standards that they have set for themselves. Ireland struggled to fire on all cylinders for a number of reasons. Firstly, there was the enforced changes and the impact that had in terms of cohesion. Scotland didn't make it easy, while the speed of ball from the ruck was often hampered by referee Romain Poite's frustrating ruling of the breakdown. 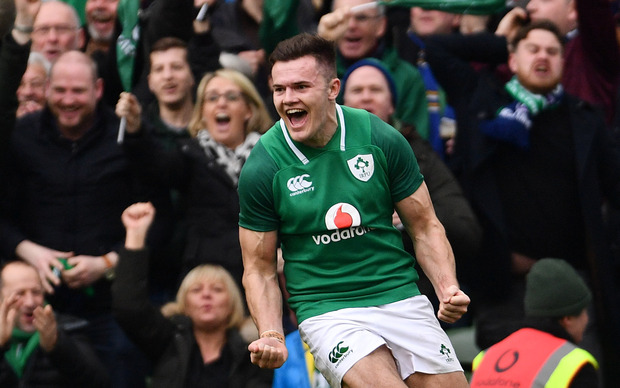 With Johnny Sexton taken out of the contest early on, it meant that Ireland were then without their two best attackers as Garry Ringrose was at home in Dublin nursing the hamstring injury that he picked up the previous week against England. Chris Farrell deputised well for the Leinster centre, and while he didn't get a chance to showcase his full repertoire, Ringrose's absence was felt as his importance to Schmidt's plan was hammered home even further. Ringrose is back running and is optimistic about returning for the Italy clash, which would freshen up Ireland's attack, but he is unconcerned that his side has not fully clicked yet this year. One of the criticisms that has been aimed at Ireland was their predictability when they got into the red zone. Had they been a bit more clinical they would have left Murrayfield with a bonus point on top of the victory, but as Ringrose explains, that is easier said than done. "When you are in and then out, sitting, watching on TV, it can be easy to criticise," the 24-year-old insists. "You don't appreciate when you're not there. Say when they do have to carry, the pressure that Scotland would have put in the collision and the ruck, you have to commit guys to hold onto the ball which can have a knock-on effect. "Teams can be quite good at that, Scotland being one of them, especially at home. "I wouldn't say that the lads' loading or depth was wrong, it was just the type of game it was. "The opportunities didn't present themselves... people looking from the outside want it to be more of an exciting game. "It's not just running, man-on-man, it is footwork into space which can create momentum and quick ball. "It might require phases previously to kick sensibly to then make their wingers or back-field sit off a bit, which would then create space on the outside. Scotland's defence was very good and those holes were hard to come by. "I think it is just the nature of the game, a bit of an arm wrestle and it's not the prettiest, but I know from experience that the work the lads are putting in, that they may not be running really wide or spreading it wide but they are working tooth and nail for every inch; whether it's at the ruck or working into space." Jacob Stockdale's try was a thing of beauty and, as was highlighted in these pages on Monday, the level of detail that goes into executing a complex move like that is remarkable. From Seán O'Brien's little tug on Simon Berghan's jersey to Stockdale timing his run to perfection, it was another moment of magic that typified Schmidt's time in charge. It was then fascinating to learn that Ringrose has never run that move in training, which suggests that Schmidt designed it with Farrell in mind, as it was his powerful carry off first phase ball that set the platform for Sexton to pull the strings. "You can be surprised when you are not in there," Ringrose admits. "There is an overlap between certain things. It is only as it happened (I recognised the move). Jeez, once Jacob got going, there was no stopping him, the pace he got up to. Then credit to Johnny for taking it so flat to the line, taking one for the team. "You vary plays to different teams, to different weeks. Sometimes it would be the same move with different options. "I haven't run that one. But there are very similar moves to it that have been done. There are so many moves in his (Schmidt's) book and they work well." Garry Ringrose was speaking at the launch of Gillette's new Skinguard razor.